latest header. After doing battle with my blog header design several weeks ago, I had decided that I would periodically change it out utilizing photographs I have taken of my sea world experienced first hand. I received many emails regarding the below photo featured in the posting, Things in my House" (http://musingsofaseawitch.blogspot.com/2009/07/things-in-my-house.html) . 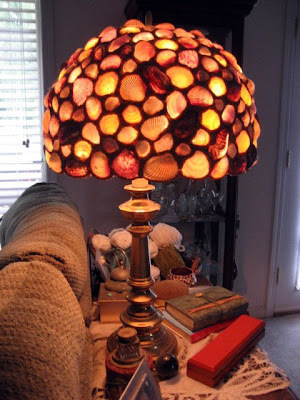 Macro shot of the lampshade made out of sea shells. This is one of those marvelous "finds" that I came across at my local Goodwill store. It was tossed in the corner of the sporting goods section. I nearly squealed with delight when I saw it and unbelieveably, not one shell was broken. It now resides in my living area and is one of my favorite pieces when lit (other than my hubby...okay, bad joke, but it begged to be said). Below is a macro shot of the shade with the light turned off. 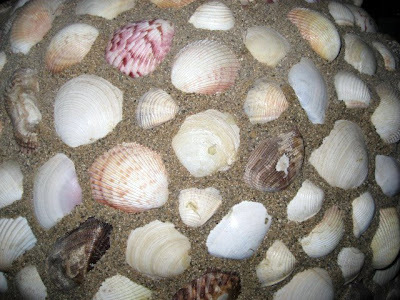 You can see the fine sand that was used over the grout to give it the appearence of a beach covered with shells. These blogs I visit have become dear to me. Like grabbing a cup of hot "anything" and laughing with the neighbor across the fence, I cannot begin my day without these daily visits to you. You are my big box of Godiva chocolates and I want to taste each and every posting. 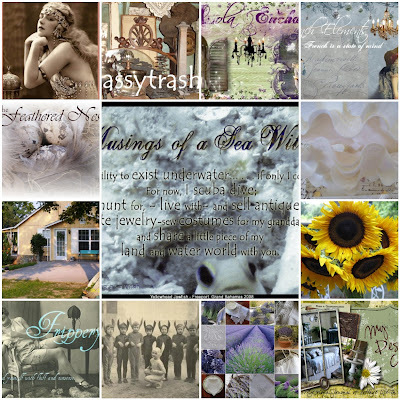 I delight in your junkin finds, your new digital art tricks, the travels, the recipes, the day to day minutia of your lives. You have unwittingly become my cyber family and I want to thank you for this gift. White Linen/Lavender Field recently showcased a nifty little tool that creates a mosaic right before your eyes...thank you WLLF (http://whitelinenlavenderfield.blogspot.com/) What a neat little bloggie tool to use and it's FREE. (http://bighugelabs.com/mosaic.php). While test driving the mosaic maker, I decided to utilize graphic headers from some of my favorite blogs that I follow. You have all inspired me and surround my life with delight. Do you recognize your header? If you do, leave a quick comment, I am always fascinated by who stops by. 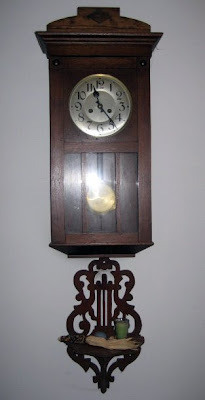 Just for grins, I decided to snap a few photos of things in my house and post them on my blog. No rhyme or reason for what I took a picture of or why...just thought it would be fun. So, I hope that you will grab your camera and do the same. Take random shots of things in your house, don't clean them, dust them, or rearrange them...share them in all of their "where they are sitting and what they look like" glory. 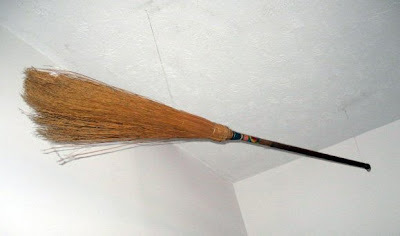 Use the post title, "Things in my house" and then scurry back to this posting, leave a comment telling me to visit and I will. 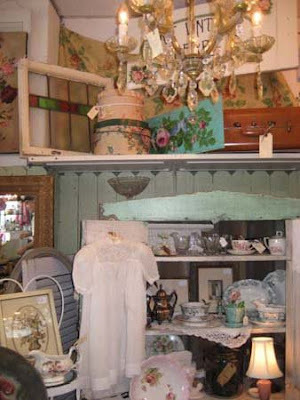 Vintage Village - my favorite place to shop. 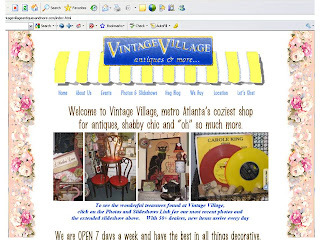 The Vintage Village website, chock full of all things Vintage Village; our events, pets picks, punch coupon, and lots of photos. 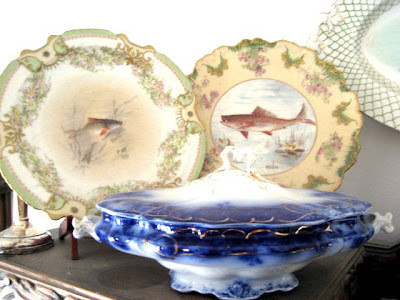 (http://vintagevillageantiquesandmore.com/). New photo slide shows are uploaded about every two weeks. Click on the link to visit the cyber side of Vintage Village. So many wonderful things to see that you just don't know where to turn first. 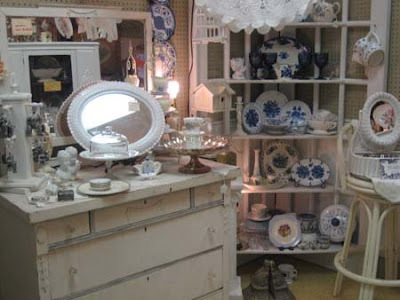 White, tone on tone is always a lovely theme and is an eye pleasing background palette for other items like the highly sought after flow blue pieces on the shelf unit. Pretty crystal chandeliers abound in Vintage Village. If you are looking for one, this is the place to come as we have them in every size you could want. Sweet vintage christening dress, pretty cabbage rose bowls and plates and a cottage cupboard in a soft green patina are offered by My Vintage Heart. 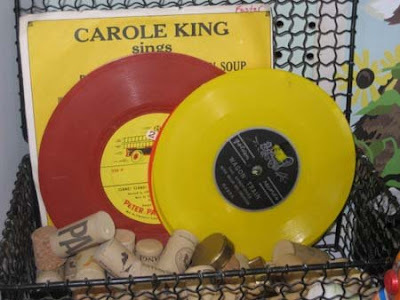 Delightful vintage records in bright yellow or red and different size corks are terrific for your altered art pieces. 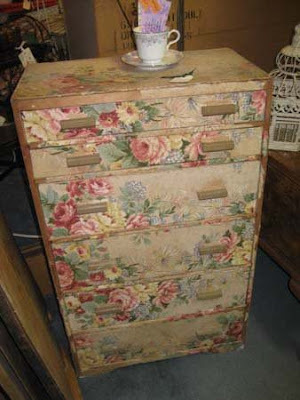 I am crazy about this vintage paper chest of drawers. My mom always had seasonal sweaters in these when I was growing up. Fantastic price at $32.00. 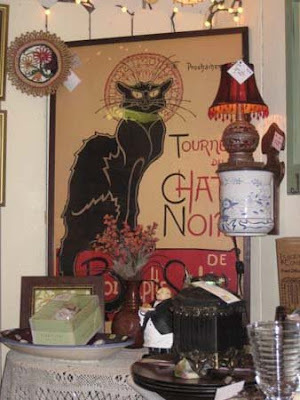 The famous "Black Cat" poster. Very French! 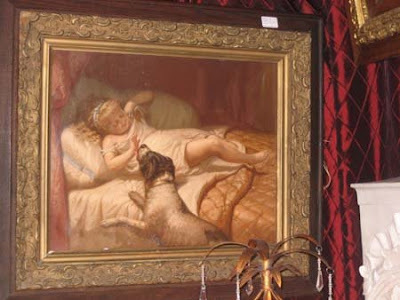 Sweet Victorian child and puppy painting in lovely vintage frame. 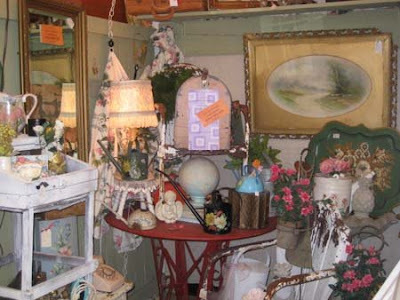 I hope you all have the opportunity to come visit the friendly dealers at Vintage Village. We adore meeting making new friends and saying hello and thank you to old ones. Oh, and that silver mesh bag that I acquired like the shameless, vintage bag collecting hussy that I am...here it is. You may recognize this little guy from my new header. 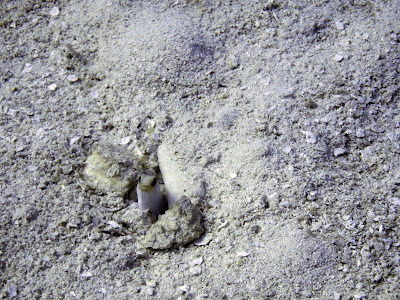 The Yellowhead Jawfish, with a name much bigger than his tiny fish body, inhabits stretches from Florida down to the northern parts of South America -- I have found them everywhere in the Bahamian Island chain. The head and upper body are a light, but brilliant, yellow color slowly fading to a pearlescent blue hue and they use their mouth to carry sand, shells, or small rocks from one location to another. 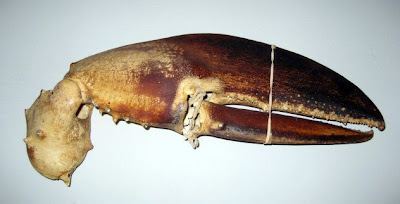 (Males are mouth brooders and will carry the eggs in their mouths until they hatch.) 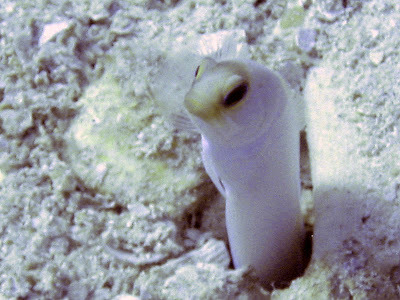 A reef associated species that live inside burrows made of crushed coral and sand, these little guys enter their burrow tail first and you can often see their head stick up from the hole while the rest of the body remains hidden. 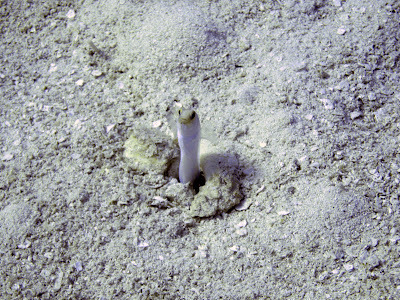 When it is not hiding it will hover vertically in close vicinity to its burrow and if anything frightens it (to include divers) they will instantly disappear back into its protective burrow tail first. From afar, a colony of Yellowheads appear like swaying grasses, but as you or a predator come towards them, the "swaying grass" all but disappears. 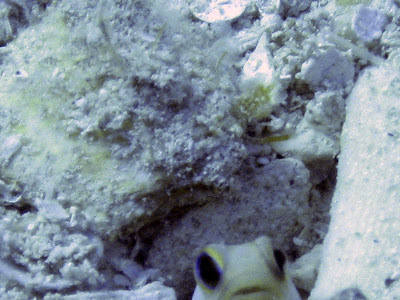 I found that if you manage your buoyancy and hover quietly at their level, their curiosity gets the best of them and they slowly come out of their burrows to check you out. I snapped a few photos but once they see the flash, they tend to bug eye and then hide again. These little creatures are amusing to watch and they have sweet little faces. Hey, who is that in front of my burrow? Sea Witch, you are to close for my taste, move back you big, bubble making, air breathing human. Sea Witch, you are awfully close to me. I think you need to back off. I'm outta here --- go visit something else...like a big, old shark. 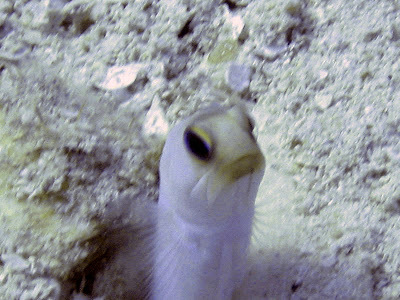 These photos were taken with a Canon Elph, using the internal flash housed in an Ikelite underwater housing unit. I am very, very new to underwater photography...more like picture taking as I am such a novice so please forgive my amaturish photos. As I take more pictures, I hope to hone my underwater photography skills. So I dumped the Disney look and decided to use different photos that I have shot under the seas or around aquariums. After all, a Sea Witch really should share her time under the sea with others. I like the clean look of the new header and with the new font for the narrative text making it easier to read. Now all I have to do is tweak the color/hue of the header title. (made these header changes on my lunch break and didn't have time to finish the tweaking...look for final tweaks this week) . As the direction of the wind changes in my world, I will also change out the photo. You will have to periodically stop by to see what swims to the surface. How fun are these bright and sunny colors? I adore these latest fabrics that are full of retro patterns and put a smile on your face colors. 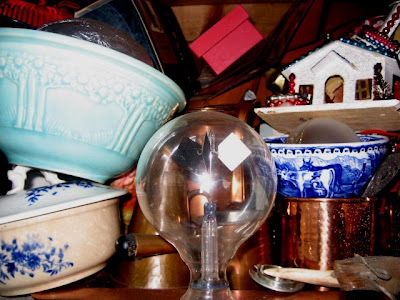 Like bloggers Frippery, Sassy Trash, and Garden Antqs Village, I also did a little junkin this weekend and came across an eclectic assortment of treasures. I was "bowled" over by these beach cottage color table top, wooden bowling pins. 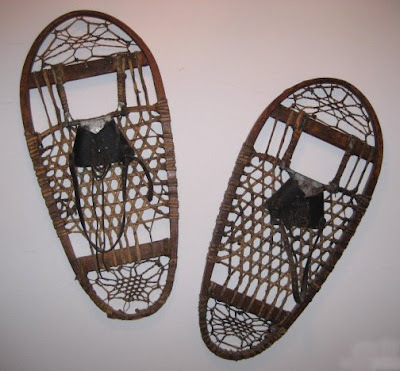 About 8 inches in height and with the original paint, I picked these up faster than a pickpocket on a carnival runway. Couldn't resist this pretty little vintage shade. Love the Steuben like colors of the glass with the pretty etching. Had a few chips, but then don't we all. 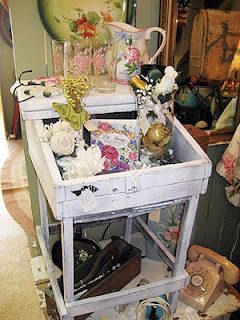 Pretty Austrian urn from the 1920s would look lovely filled with your favorite fresh flowers. I'm a sucker for pink lustre ware and these gaudy little pieces just make me smile. I have to laugh as my friends know that I'm not a pink kind of gal (unless it is sun faded) much to my granddaughters chagrin. She lives in a pink and lilac world, God bless her. My style is American Primitive combined with Art Nouveau (now that is a unique marriage)...and of course, shells abound everywhere. Another Pink lustre ware tea cup and saucer and an adorable pair of tiny white silk and beaded Indian shoes for a small child. I know somewhere, out there, a Jasmine wannabe is waiting to find these shoes to complete her outfit too small for my 4 year old granddaughter, these will have to find there way to smaller tootsies. A complete set of crystal salt cellars AND AND AND with glass salt spoons to match. A terrific find for only a few dollars. You can't see it, but I'm doing the I found a terrific buy happy dance. Couldn't resist this old speller from the turn of the century and a pair of Reed & Barton silver plate bon bon dishes. Bon Bon dishes...such a 1950's word where lazy housewives were accused of not doing much but sitting around eating bon bons. Okay, happy dance again. I love vintage general/country store pieces and this turn of the century tin, "multi-use" spice bin is a wonderful acquisition. The faded green and Times Roman lettering of the word "MUSTARD" actually spins to reveal Baking Powder, Ginger, Cloves and another spice faded and washed away that it is no longer known. 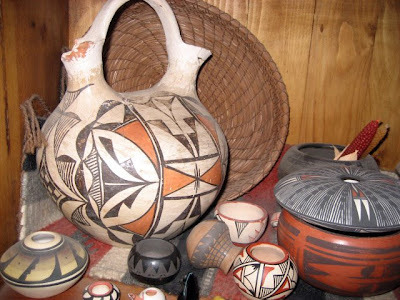 You lift the top up to drop in whatever spice the mercantile owner would have and the shopper would utilize the porcelain knob to lift up the bottom to retrieve the amount of spice they wanted to purchase. 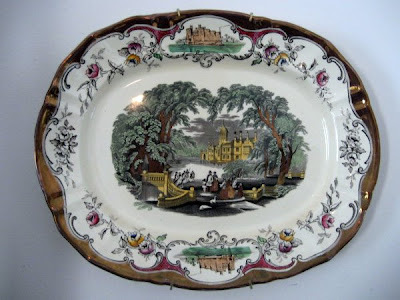 Overall, the piece has pretty waterfall lines to it and it is in marvelous condition for its age. And last, but not least, the lovely Marie Antoinette herself. 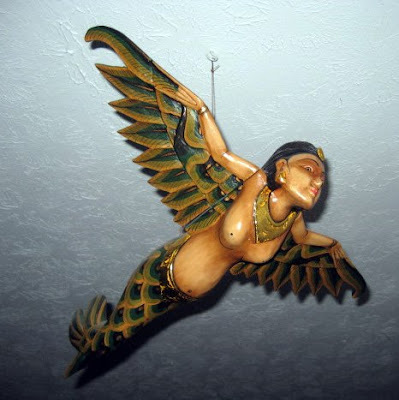 Two of my favorite blogs have a fondness for this French lady (The French Elements & My Artful Adventures) . 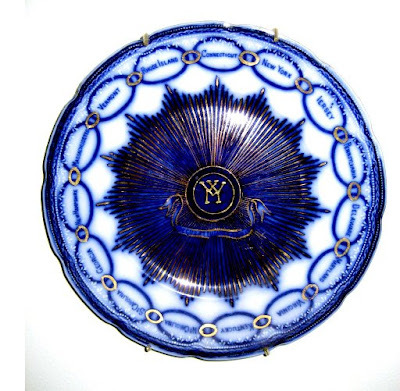 This California Pottery offering is in wonderful condition with only two places missing some lace and that is on the bottom of her gown and the back of her collar. These porcelain lace pieces tend to break away so easily and the fingers are almost always gone...this French lady still has all ten fingers with her sassy red polish. Had to give you a closeup of her lovely face. 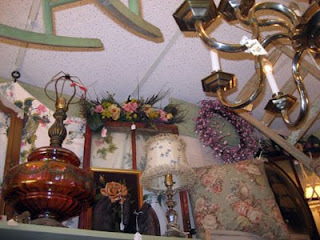 As usual, I can be found at Vintage Village sometime over the weekend taking new photos for their website and depositing some of my found treasures for my booth. So many talented dealers here that I can never walk out without even the smallest purchase. Lots of new things in daily. Below are two photos to entice you to come visit. We have the best shabby, chippy lovingly worn items anywhere in town. So, this was my weekend and now I'm back at my Monday thru Friday 8 to 5 gig, but hey, it's Tuesday and that means Saturday will be here in three days. Whooo hoooo. Have a joyful week everyone. Guest poster - Rosie Ducks or Duckie Roses? A fellow blogger, Dances with Flowers, has been ordered to bed rest by her doctor for the next few weeks and she has asked some of her frequent visitors to become a guest poster for her blog, Dances With Flowers. The fact that she would even invite me to offer up a posting means much to me as my bloggie verse is probably more indicitive of why I could never be an author...I tend to write like a speak...need I say more? Jennifer is one of those souls who is passionate about the garden, planting, flowers, etc. 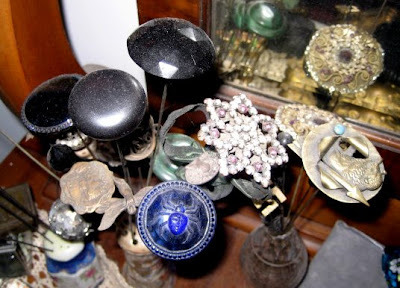 and many of her guest bloggers are professional gardners, horticulturists, outdoor architects so this humble Sea Witch had to come up with a posting that would appeal to her love of flowers and yet still offer up a posting that offers a little piece of me. So adventures in Rosie Ducks is my offering. Please stop by Dances With Flowers and send Jennifer get well wishes and hopefully, my guest posting will make you smile. Majestic Sea Swap arrived...I'm a happy girl! I'm writing this post as I sip the flavorful Mediterranean tea and wearing my "color of the sea" bracelet that Stefani, my Majestic Sea Swap partner made for me. This was my first blog swap (thank you Gypsy Mermaid http://gypsymermaidlife.blogspot.com/) and I must now declare that I am totally hooked. Oh, what wonderful treasures came my way from my swap partner in Germany. So as Julie Andrews sang, "Let's start at the very beginning, a very good place to start"... the bright yellow box arrives with foreign stamps and languages...I'm already grinning from ear to ear. So I grab my take-out Chinese and plop myself on the living room floor and begin the opening. 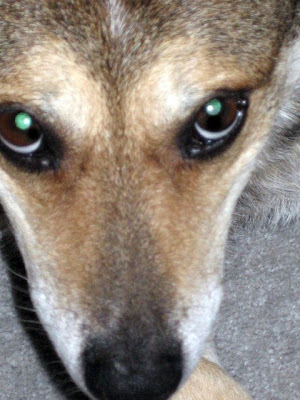 Kota, my coyote mix dog is manic with the new smells and he immediately shoves his wet nose into the box searching for hidden doggie treasure. He was so driven with the need to nose through the box that I had to pull him away because he was shifting everything before I could snap pics of what was inside. 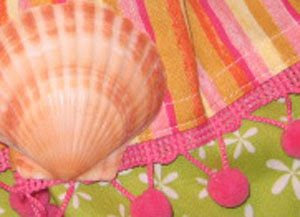 A lovely shell postcard of a heart and friendly words from my new blog friend from Germany. Stefani has a passion for altered art and textiles and the first item I pulled out of my treasure box was a banner of felt sea horses, shells and coral that she had made. What fun and behind this was a small box of various sizes and colors seahorses for my use in altered art. 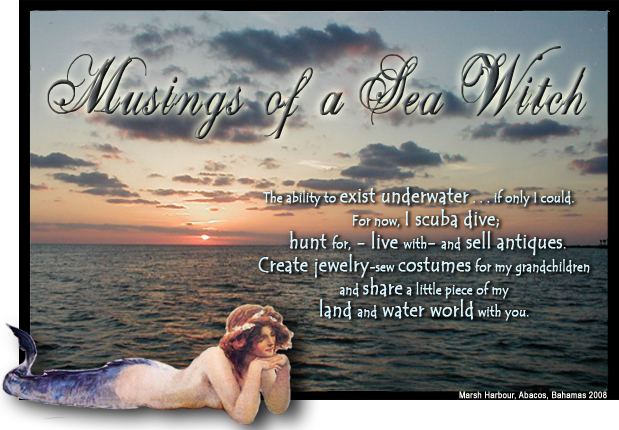 I see mermaid tags being made this weekend. But wait, there is so much more. It seems like the box is a bottomless pit because as I pull one item out, two more seem to appear. The heady scent of fresh lavender fills the air and I begin to pull pretty wrapped packages from this box. Yes, lavender, my favorite scent and lovingly plucked from Stefani's yard. What a wonderful gift she has shared with me, from her home to mine. 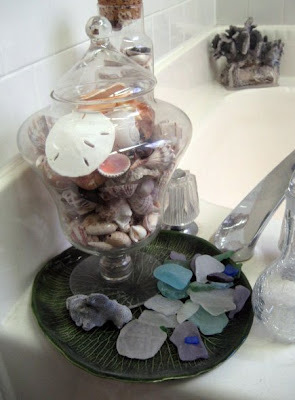 More goodies come forth...Italian tea, beach Kleenex with pretty shells and sea gulls, lovely scrapping paper the color of Caribbean reefs, a tiny match box filled with a bling covered, silver anchor pendent and shells...what fun! Among this grouping of gifts is a small box and inside is a bracelet made especially for me by Stefani. It is a lovely piece and constructed from matt seaglass looking glass beads and paired with silver spacer beads all in the colors of the Bahamian reefs that my honey and I so love to snorkel, swim and dive through. I couldn't be happier with this lovely bracelet and Stefani's home grown lavender...but there is more! I finally pull everything out of the box and unwrap all...a pretty hand towel embroidered with lavender flowers, a hand sewn, stuffed fabric seahorse that will hang from my Christmas tree with the date and the giver's name on it. I will enjoy bringing this out each holiday and hanging it from my tree. What wonderful memories of this treasure box it will bring each year. Pretty white porcelain shell repositories, perfect for hiding rings in. A lovely aqua blue glass vase with more shells and lavender...how this arrived without breaking, I will never know and last but not least, a shabby cottage Willkommen sign. Stefani, this pretty little sign means more to me then you may realize. My family has always had the German welcome sign in our houses no matter where we transferred to. 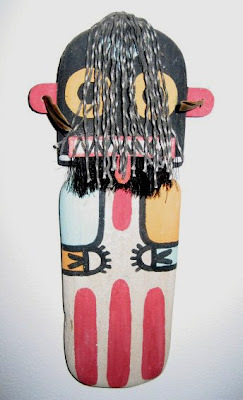 It was a gift given to my parents by friends they made in Germany back in the 1960s. My husband and I often will say to folks at our door, "Willkommen", Bienvenue, Welcome, Come on in" ... that famous line spoken by the late, great Madeline Kahn in Blazing Saddles. Now I have a German Willkommen sign just like my mom and dad did and from my new friend from Germany. Had to immediately hang my "willkommen"sign up at my front door below my hanging shells. It looks lovely and can't wait for my honey to return from his camping trip. When he sees this he will be delighted! So many wonderful things you have sent to me that I am overwhelmed by your thoughtfulness, creativity and generosity. I am so pleased you were my swap partner and I hope that you will enjoy what I have sent to you as well. Fondly, the Sea Witch. Can I BE more blonde?